Overcast skies and the threat of rain failed to dampen the spirits of a group of international students on a field trip to learn more about Oklahoma and its people on Nov. 8. 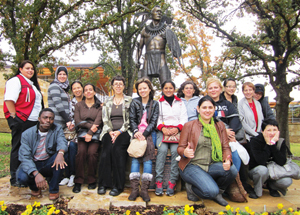 Twelve students from OCCC’s English as a Second Language Bridge program traveled to the Chickasaw Cultural Center outside of Sulphur to experience early Native American culture. “The Bridge class has recently done some reading on Indian removal and Chickasaw history,” Professor Abra Figueroa said. Figueroa is director of the English as a Second Language program at OCCC. “Seeing these things in person really helps them learn better and backs up the things we learned in the classroom,” Figueroa said. The students and five staff members braved the dismal weather as they toured the 96,000 square foot, state-of-the-art facility that opened in July 2010. “This is not just a museum, but a living building,” said tour guide Jasmine Hatton. With the help of guides and cultural center employees, Hatton took the group on an educational trip through the facility, which included viewing a film in the Anoli’ Theater, which boasts a 2,700 square-foot wraparound screen. The 44-foot-by-62-foot movie screen is the second largest of its kind in the state. Hatton led the group into the Chickasha Poya Exhibit Center, where sensors triggered short films and audio clips about the history of the Chickasaw Nation. The exhibit hall also featured several dozen artifacts and replicas that helped the ESL students fully appreciate the culture of the Chickasaw people. The Chickasaws originally lived in the southeastern U.S., near Tupelo, Miss., Hatten said. The U.S. government forced them to leave their homes and relocate to Oklahoma in the 1840s so their land could be occupied by white farmers. The Chickasaw Nation now numbers over 38,000 people, making it the third largest Indian nation in Oklahoma and the 13th largest in the U.S., according to cultural center employee Keela Davis, 26. The international students observed a “stomp dance” and listened to a flute song performed by native Chickasaw cultural center employees. Chickasaw tribal member Jeremy Wallace, 26, said he has been performing the stomp dance for center visitors since the facility opened a year and a half ago. “The stomp dance is used to greet new friends and make them welcome,” Wallace said. Some of ESL students took advantage of an invitation from Wallace and joined in the dance, which wove around the theater stage in a snake-like fashion. The dance was accompanied by the beat of traditional rattles made from turtle-shells and the sound of moccasins, worn by the women. “The main goal of the cultural center is to pass our culture on to other generations,” Wallace said. One student said she found familiar strains in the Chickasaw story. “Mongolian culture in China is very similar,” said Yanming Brown, an ESL student from China. The group ventured through puddles of water and mud to tour a replica of a traditional Chickasaw village and learn what the various structures were used for. “This is a good place to learn,” said Sangita Shrestha, a 23-year-old student from Nepal, as she posed for pictures with a friend in a large corn crib. This is the second field trip taken by the ESL Bridge program this year. In late September Figueroa took the group to the Wichita Mountains to learn about early Oklahoman history. To contact Mark L. Simpson, email onlineeditor@occc.edu.